Admits all the horrible news about Rhino poaching it is very encouraging when a new Rhino is born. 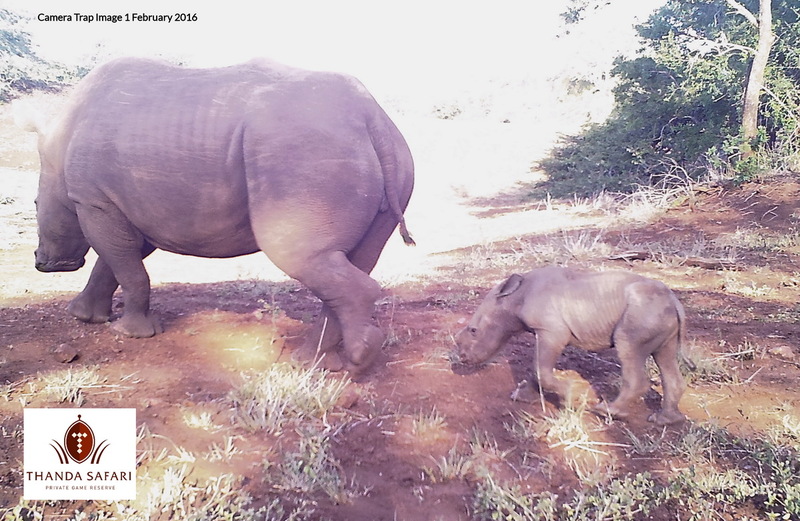 One of Thanda’s oldest White Rhino female gave birth to a little boy on 30 January 2016. Two days later this picture was taken by a camera trap near a waterhole. All of us a Thanda are looking forward to seeing mother and son on many of our game drives! If you would like to support the fight for Rhino survival go to http://www.projectrhinokzn.org or contact us at wildlife@thanda.co.za. Females reach sexual maturity at 6–7 years of age. The gestation period is 16 months. A single calf is born and usually weighs between 40 and 65 kg (88 and 143 lb). Calves are unsteady for their first 2 to 3 days of life. Mum is very protective of her calf and will fight for it vigorously. Weaning may start at 2 months, but the calf may continue suckling for over 12 months. The birth interval for White Rhino is between 2 and 3 years. Before giving birth the mother will often chase off her current calf.